Mustard spinach (tsunga) is a vegetable of choice amongst the adult population in Zimbabwe. Recipes include mixing the vegetable with different types of stews, mixing the vegetable with tripe or other offal, boiling the vegetable and then mixing it with peanut butter sauce or my personal favorite, broiling and then adding tomatoes, onion and salt for taste. In our home these dishes feature prominently whenever we have mustard spinach in the garden. In fact mustard spinach happens to be the only vegetable that my wife actively encourages me to grow. Mustard Spinach (Tsunga) Is A Vegetable Of Choice: At the beginning of the cold season I discovered half a packet of mustard spinach seeds. I had open space in my little garden courtesy of a carrot crop which we had finally exhausted after several weeks of enjoying fresh carrots. I prepared a small seedbed and in no time there were some healthy looking plants ready to be transplanted. After the initial shock of being moved from the seedbed the plants started flourishing. 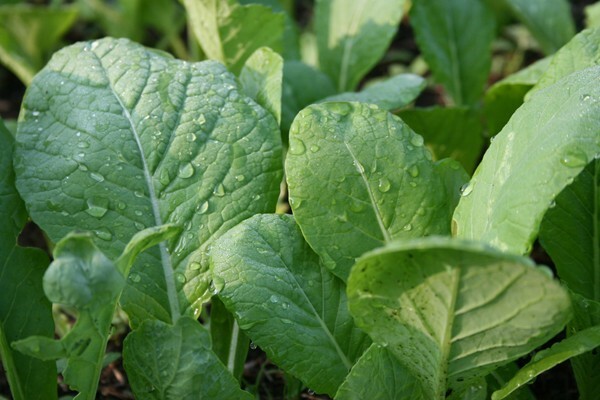 Like all the other plants in my garden the mustard spinach received a lot care and I had no doubt that a harvest was in the offing. Then, one very cold morning, I woke up to find that the frost had burnt up the entire crop except for one plant which looked as healthy as ever. The inner voice of hope that I always carry told me that the plants were going to recover that was not to be. The lone mustard spinach continues to flourish but we cannot pick up its leaves for the pot because they will not be enough. I am saving the plant for the seeds once it flowers, pods and eventually dries up. The demise of my spinach had me asking questions about how some farmers in the area were still getting vegetables of all sorts, mustard spinach included, to the market. The answer was simple: green houses and perennial crops. The story of the mustard spinach plant is instructive in that it taught me to do things in tandem with seasons. Many a times our bright ideas fail because they were planted in the wrong season. The lone mustard spinach plant in my garden is a symbol of hope after a failed venture. It tells me that there still seeds of greatness locked up on my inside and in the right season I will yet again throw see into the ground. Some ideas have to be insulated from the elements of weather by green housing them. In our daily walk there are too many things working against even our brightest ideas and like the farmer you have a duty to insulate your bright ideas from the 'elements of weather'. The perennial plants are those ideas that will not succumb to the elements or whatever pressures the world will be exerting on you.